Hints of the Higgs boson detected last year by a US "atom smasher" have become even stronger, scientists have said. The news comes amid fevered speculation about an announcement by researchers at the Large Hadron Collider on Wednesday. Finding the particle would fill a glaring hole in the widely accepted theory of how the Universe works. This 30-year hunt is reaching an end, with experts confident they will soon be able to make a definitive statement about the particle's existence. The latest findings have come from analysis of data gathered by the US Tevatron particle accelerator, which was shut down at the end of last year. Researchers squeezed the last information out of hundreds of trillions of collisions produced by the Tevatron - which was based at the Fermi National Accelerator Laboratory (Fermilab) in Illinois - since March 2001. This final analysis of the data does not settle the question of whether the Higgs particle exists, but gets closer to an answer. The scientists see hints of the boson in roughly the same part of the "search region" as the LHC - between the masses of 115 and 135 Gigaelectronvolts (GeV). The signal is seen at the 2.9-sigma level of certainty, which means there is roughly a one in 1,000 chance that the result is attributable to some statistical quirk in the data. In particle physics, three sigma counts as "evidence". Claiming a discovery requires a statistical certainty of five sigma - which denotes a one in a million chance that any given result is a fluke. Fermilab's Rob Roser, co-spokesperson for the Tevatron's CDF experiment, said: "Our data strongly point toward the existence of the Higgs boson, but it will take results from the experiments at the Large Hadron Collider in Europe to establish a discovery." Stefan Soldner-Rembold, professor of particle physics at the University of Manchester, told BBC News: "The evidence is piling up... everything points in the direction that the Higgs is there." He added: "At the Tevatron a lot of important work has been done over the last years... it has been essential for arriving at this stage. "So yes, the Tevatron experiments should get recognition for that, even though the LHC will be the collider to provide the final proof that the Higgs exists." The Higgs is the cornerstone of the Standard Model - the most successful theory to explain the workings of the Universe - and explains why all other particles have mass. But it remains on the run; though it is predicted to exist, the particle has never been detected experimentally. If the LHC confirms the boson's existence, physicists will set about the task of working out whether or not it is the version of the Higgs predicted by the Standard Model. Many researchers will hope it is not, because that would hint at phenomena outside our current understanding of physics. The Higgs cannot be seen directly; physicists have to infer its existence by looking at the particles it has ultimately decayed - or transformed - into, and work backwards to "reconstruct" it. 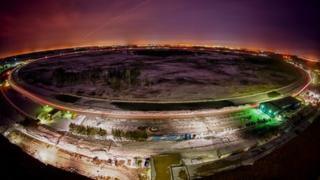 The Tevatron and the LHC look for the boson in different ways. The LHC is expected to present evidence for a Higgs transforming into two photons - the rarest decay path predicted by theory. The Tevatron appears to see hints of a Higgs transforming into particles known as b quarks - the most common type of decay. Combining information from both accelerators will provide vital clues about the nature of this potential new particle, and whether it is really the Higgs boson scientists expect. Most researchers now regard the Standard Model as a stepping stone to some other, more complete theory, which can explain phenomena such as dark matter and dark energy. A non-conformist Higgs could open the door to a theory called supersymmetry - which predicts that each Standard Model particle is accompanied by a heavier partner known as a "sparticle". Or it could hint at the existence of extra dimensions. For physicists, these would be more exciting outcomes, and would keep them busy for many years to come. What does Tevatron closure mean for US?